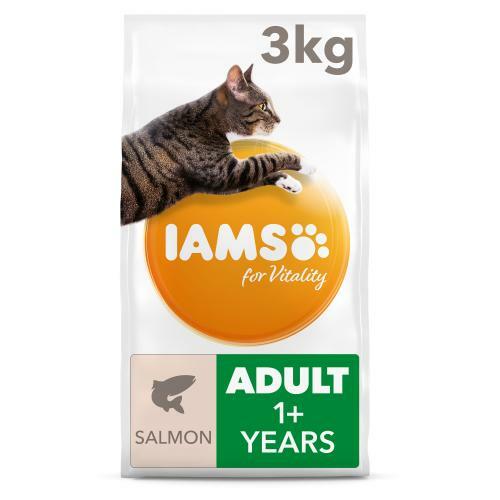 IAMS for Vitality for adult cats with salmon is a 100% complete and balanced cat food for your pet to enjoy and thrive on. Our improved recipe contains 88% animal protein (out of total protein) and everything your furry friend needs as well as a delicious taste. Each cat has a unique personality. And only you knows your pet individual character, but Iams knows the nutrition they need for the 7 signs of healthy vitality. HEALTHY URINARY TRACT: Formulated to reduce urinary pH. HEALTHY TEETH: Crunchy kibbles and tailored mineral levels to help reduce tartar build up for healthy teeth. STRONG MUSCLES: High quality animal protein and essential minerals to help maintain strong muscles. HEALTHY HEART: Taurine to nourish the heart. 87% animal protein* No fillers, artificial colours, flavours or GMOs. Wheat free (produced in a factory that handles wheat). Dried chicken & turkey 41% (chicken 25%, a natural source of taurine), maize, pork fat, salmon (4.1%), rice, dried beet pulp (1.7%), chicken gravy, fructooligosaccharides (0.69%), potassium chloride, fish oil, brewer's dried yeast.